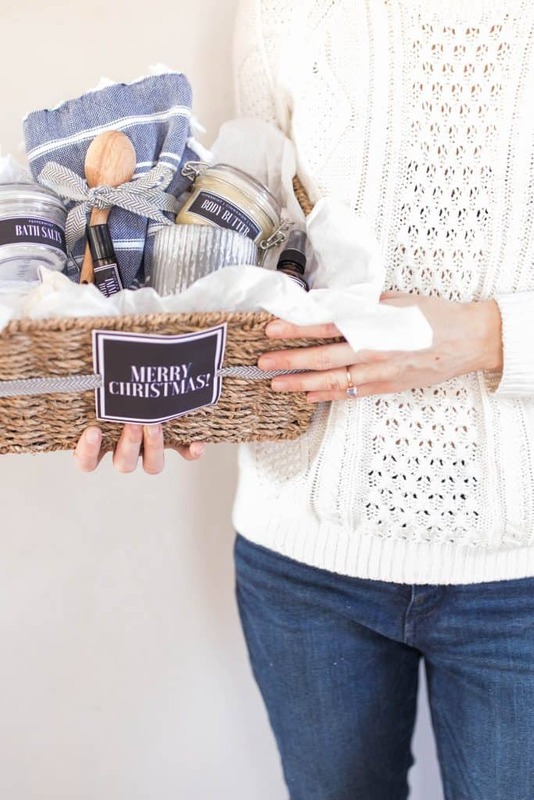 These handmade Christmas gift baskets are the perfect thoughtful gift for the people on your list who you don’t know what to buy for. They are filled with useful items that they can appreciate all winter long. They are all natural and simple to make. I love making handmade gifts for Christmas. When you have several people on your list who you don’t know what to buy for (teachers, cousin in-laws, grandmas, aunts) they are the perfect way to show that you care and get them something they may actually use. I remember when I was kid, the standard gift for someone who already had everything, or who you knew absolutely nothing about their interests, was a lotion and shower gel set from Bath and Body Works. I still remember the lower vanity cabinet overflowing with half used gift sets. Although I loved the smell of Country Apple, which you could catch a whiff of 30 feet down the hallway, the toxic ingredients don’t do a whole lot for health. 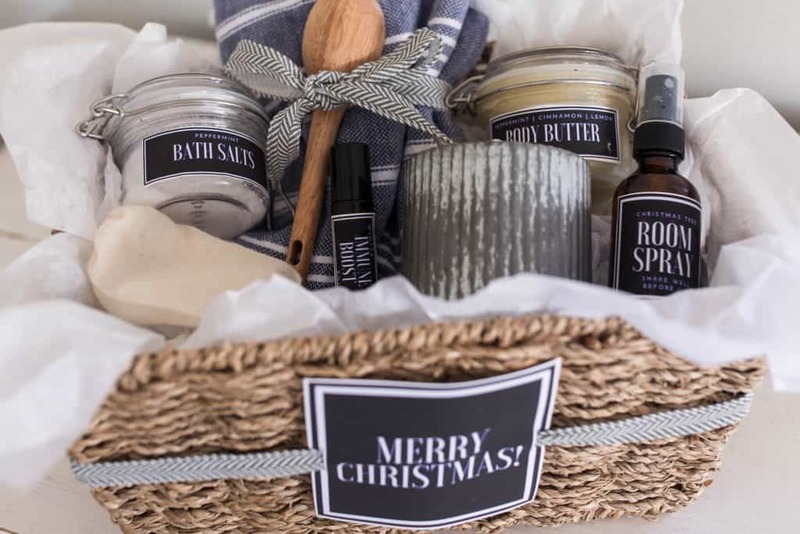 The handmade items in this gift basket are full of all natural ingredients and essential oils. They are hydrating for the skin, smell delicious and have positive health benefits. If you have a long list of people who you usually need to get gifts for it’s a great idea to spend a Saturday making everything in large quantities and putting baskets together. Don’t feel the need to add every single thing from the list. 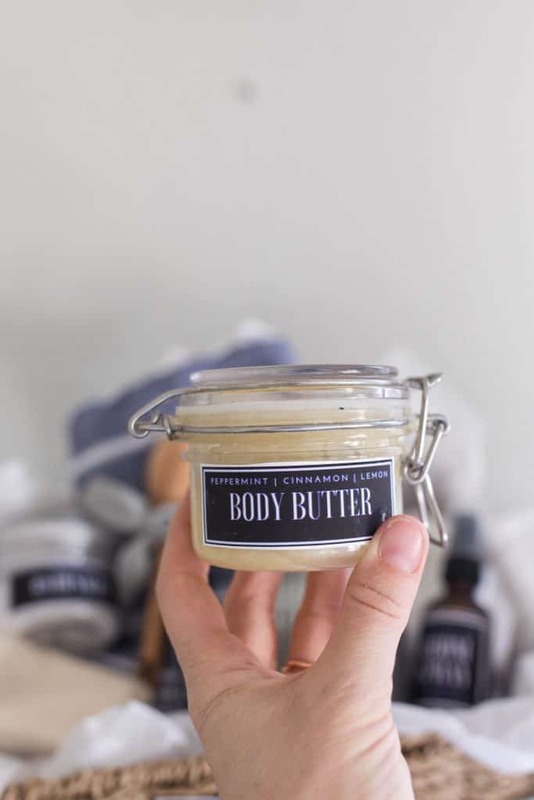 Even a sweet little beeswax candle, a jar of body butter and a tea towel are a great set in a gift bag. If you have someone on your list who you like to spoil a little more, you can make the entire thing. The key is is simplicity and thoughtfulness. Gather all of the ingredients (linked below). Gather all of the containers (linked below). Print off the labels (linked below). Set aside an entire day to knock out 10+ gift baskets. And make sure to save some of the items for yourself! You’ll thank me midwinter when cold air and hot water have caused your hands to dry out. That body butter is amazing! 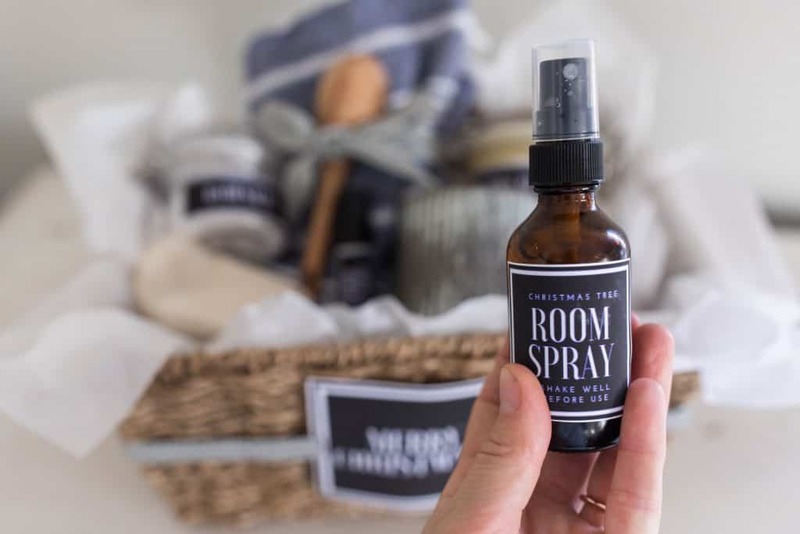 Room spray is a great way to get that cozy Christmas tree scent in every area of your home. It is subtle, yet festive. Spray it on the stockings on the mantle, or the towels hanging up in the bathroom. Fill a 4 ounce amber glass spray bottle half way up with witch hazel. Top off with filtered water. If you are just starting with essential oils, and do not have all of these in your collection, don’t worry! You can still make this room spray. It is fun to create your own custom blends. If you only have a few oils, increase the amount of each so that the total number of drops is about 35-40 for a 4 ounce spray bottle. Most starter kits (from Young Living and doTERRA) come with blends called Thieves and Onguard. They smell great for Christmas all on their own, so it it’s all you have, make this room spray anyway! In keeping with the Christmas/winter scented items in this handmade gift basket, I added these peppermint bath salts. 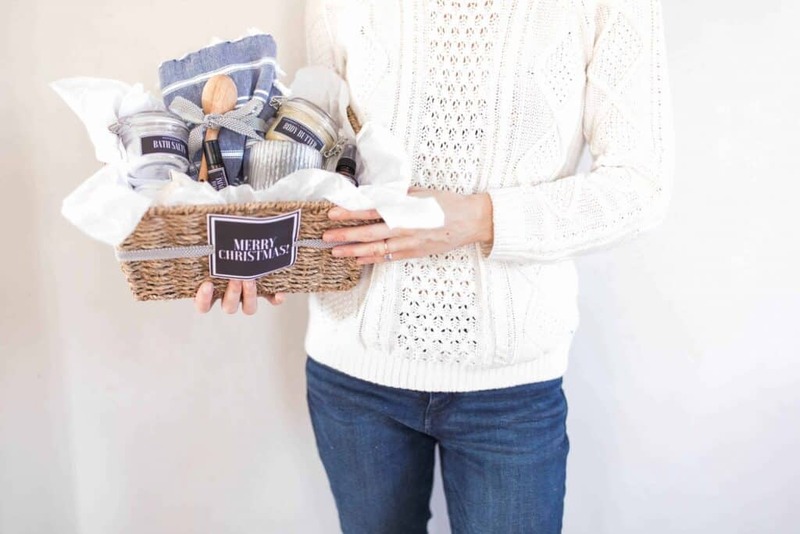 The person you are gifting the basket to can add a couple scoops to a steaming hot bath to soak the day’s cares away. Combine all the ingredients in a small bowl. 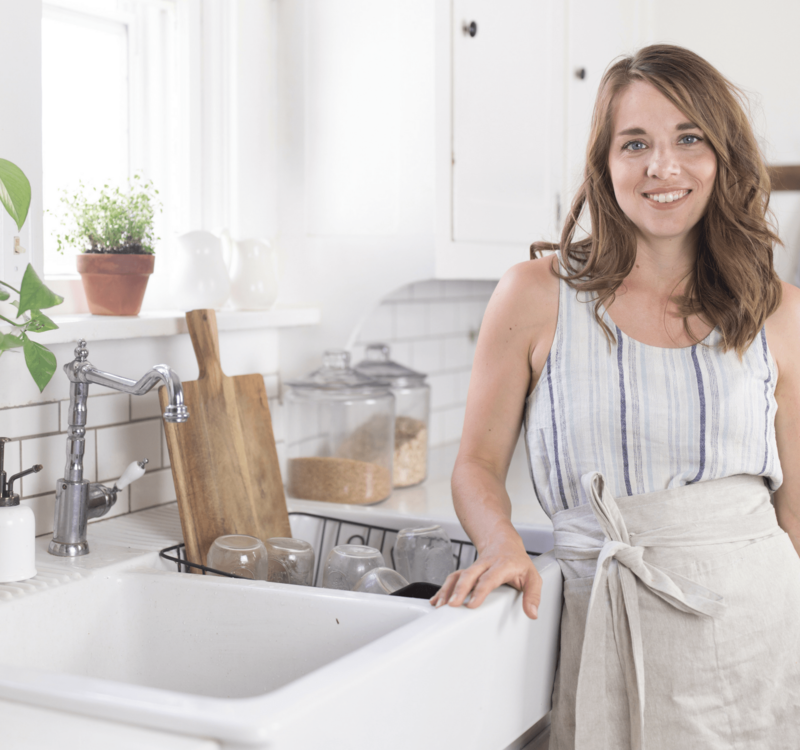 Store in a mason jar, or flip top container, for up to one year. Add all the essential oils to a 10 mL roller bottle and top it off with fractionated coconut oil. The combination of these four oils is useful in strengthening the immune system. It is also helpful in decreasing the duration of symptoms when sickness strikes. Roll it on the bottoms of the feet for immune support during cold and flu season. You can find out more about this roller bottle, and its benefits, in this post. The smell on this simple recipe is amazing all on its own. 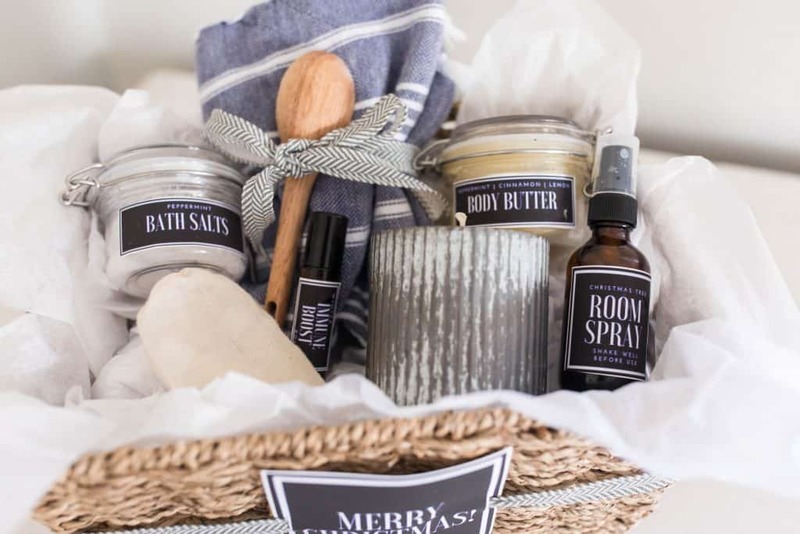 Add to that the skin healing benefits of the cocoa butter, essential oils and shea butter, and the people receiving these gift baskets from you may get addicted. Warning: they may ask you to make it for them again and again! This is a little variation on the lavender body butter recipe I usually make the rest of the year. For the essential oils portion of the recipe, add 20 drops peppermint, 10 drops cinnamon and 5 drops lemon. *Lemon is a photosensitive oil, so don’t expose your skin to direct sunlight (or a tanning bed) right after applying. I shared how to make beeswax candles on my blog last year. They are the perfect addition to any handmade gift basket. I mean who doesn’t love candles? I made mine in these adorable little galvanized steel tins. I didn’t actually include this in my gift basket, but it’s another great addition if you’re feeling overly ambitious. 😉 Especially if you have a loved one in your life who suffers from winter sniffles! The breathe salve is great to rub on the chest during times of congestion. Add the coconut oil and beeswax to a double broiler, and heat until melted. Pour the melted mixture into one ounce tins. If you don’t have a breathe blend essential oil, go for a combination of peppermint and eucalyptus. This combo is also perfect for opening up those airways and dealing with the winter stuffies. 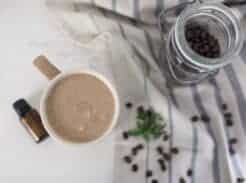 Last but not least, DIY Organic Cocoa Lip Balm. This stuff is good, especially for winter when the cold dry air causes chapped lips. 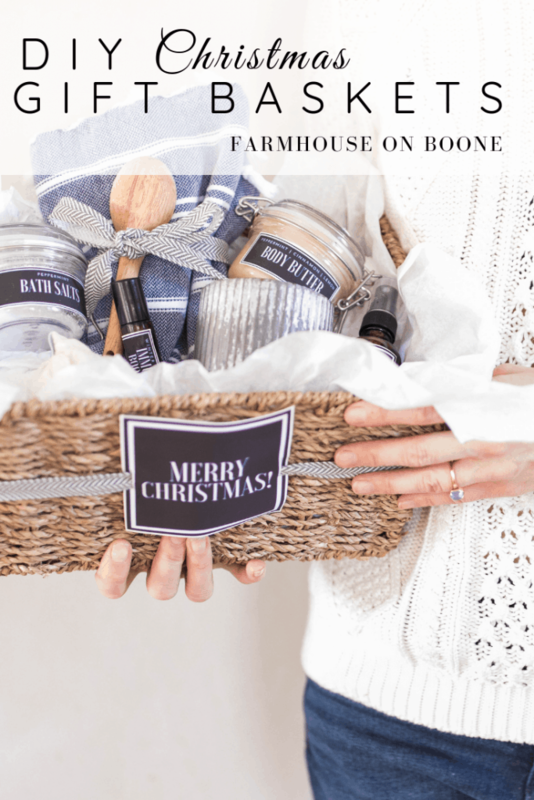 One recipe makes a whole lot of lip balm, so I keep it on hand for gift giving. In this case, I put a couple tubes in a small muslin bag to go in the basket. Use peppermint essential oil to give it the perfect taste and scent for winter. 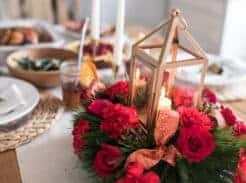 If you only make one or two of these items, you can throw in some simple DIY Christmas ornaments to fill the gift basket! Add tissue paper around the outsides of a shallow and wide basket. I used this seagrass basket from Amazon. Take a few sheets of tissue paper, crumple them a bit, and stuff them around the bottom of the basket. This will help to give the items in the basket some height. Play with the placement of the items so that everything can be clearly seen. 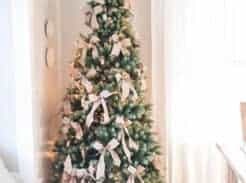 Fill in the empty spots with ornaments, a tea towel or Christmas greenery. I watched your course on essential oils and went on to register with doTerra. I wanted to do it through you but I did not want to receive my products through the US as I am Canadian. I am willing to enter you as my enrollee and sponsor but need your ID number. I realize this might be complicated but I thought I could offer you the choice. I have already ordered Family Essentials. Keep up your good work and make sure you take care of yourself. Thank you so much for the gift basket idea. I’ve made most of the recipes and I’m ready to print your labels. I do wish however there were multiples of each label on the sheet. I feel like I’m going to waste so much paper on these labels by having to print a whole page for each gift basket I’m making. It might be a good idea for future print options. Thanks again for your great content!